Leeds Farm features fall family fun on the farm! They have enough farm and fun activities to keep your family moving all day, including the Back 40 barnyard activities, hayrides, farm animals, and farm pond. 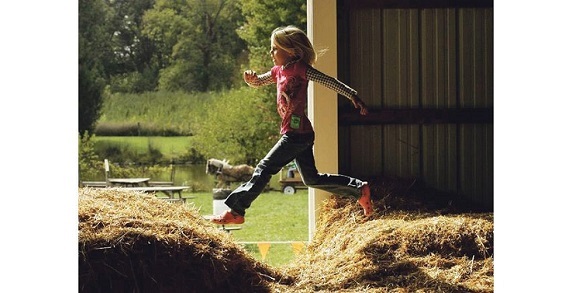 Barnyard and Play Barn activities include two Pumpkin Jumps, John Deere combine slide, hayrides, pedal carts, Paintball on the Porch, mountain slides, zip lines, rolling tubes, and straw forts. Be sure to check out this year’s new activities—climb the Tractor Tire Tower, ride to the pasture on the Holstein Hustle barrel train, and choose your steed in the Iron Horse Corral. Feed the goats, cheer for the pig races, listen for the donkeys to bray, and select the perfect pumpkin from the thousands Leeds Farm grows right here on the farm. Marvel over blue pumpkins, fairytale pumpkins, exotic shapes of gourds and more. Open six fall weekends from September 22 to October 28 and also open one Friday, October 19 from 10am to 5pm. Visit www.LeedsFarm.com for special events details and coupon for September 22-23 admission discount.